As you know, I measure a lot of quantitative data about myself I believe that measuring something in my life gives me a lot of insights in the things that I want to discover. The whole Western society is using quantitative data to measure everything. Our research is quantitative, our companies/universities/schools use quantitative standards, and our health is also quantified in numbers. I like quantification because it gives objective, and comparable standards for everyone. However, there are certain problems in measuring and quantification. I noticed a lot of these problems during my own self-tracking experiences so I wanted to discuss them. Nevertheless, these problems can be applied to (almost) everything that we measure quantitatively (and we Western people like to measure a lot). In this blog, I will sum a few of these problems that I discovered within my own self-tracking practices. I will use my own examples combined with general examples to show you the problems of quantification. People want to measure a lot of things that are important to them, happiness, stress, sleep, and health can be examples. Because Quantified Self has a lot of relation to health, I will use health as the main example in this blog. When one wants to measure health, there are many indicators that can be measured. Our body weight, blood pressure, cholesterol, glucose, fat percentage, HRV, etc. can all be used to indicate something about our health status. Thousands of studies have been conducted to find ways to reduce body weight, blood pressure, in forms of exercise and nutrition interventions. However, we don’t know the proportion that each variable contributes to our health, and we don’t know which variable is the most important contributor. That is simply because we don’t have anything that can measure our “health” directly. We don’t have a single unit that can measure our health. Is health about feeling healthy or is health just longevity? Currently, there is no consensus about it. It is crazy that these very important variables don’t have any strict definitions and operationalization’s. Sleep, physical activity, and stress have the same problems as health. I don’t want to go into the definition of health here, but for the sake of the argument, we could take longevity (how old you become) as the definition of health. Blood pressure, telomere, length and food-intake are predictors of health when we take longevity as a measure for health. However, they are not perfect measures. There is no variable that can predict your age with 100% accuracy (also if we exclude external causes). A dietitian will argue that nutrition is very important for health and longevity. But he will also argue that you can’t predict longevity based on nutrition alone. He will say that nutrition is very complex. There are fruits, vegetables, snacks, etcetera that all have different nutritional components. Fruits might the best products for a good nutrition. But within fruits there are certain types of fruits that are stronger predictors on health than other fruits. This same process will account for a sleep scientist, he will argue that not just sleep hours are important but sleep phases as well. A movement-scientist will argue in the same line within his paradigm. You can’t just take one variable that indicates “healthy nutrition”, “healthy sleep”, or “healthy activity”. Every sub-variable of health (like nutrition, sleep, and ad activity) is a very complex combination of different sub-meta variables. After discussing with that dietitian he will probably end-up saying, well it is not only fruits that are important, but it is all the nutritional variables combined, your fruits, your vegetables, your snacks, your wheat-intake, and some more nutritional variables, together will indicate how healthy you are. The sleep scientist will argue something comparable like; “awakenings, temperature, your mattress and length of your sleep combined predict a healthy night of sleep”. A movement scientist will argue something in the same line. In each disciplinary the (specialists/ scientists) are trying to find out the best algorithm that will predict better health, within their specialized area. As you might have argued already, it is not only your nutrition, sleep, or activity separately, all of these factors have to be combined in order to predict your health. Nutrition, sleep, and activity should be in some sort of equilibrium that makes up a fitting model that can predict health. As a human, I am very keen on discovering how I can combine the different area’s to become as healthy as possible.). To answer that, we should ask the question; “what is health?”, and ‘How can factors like sleep, nutrition, and exercise be combined?’ I don’t even know which professional could answer this question, maybe a health-philosopher or a holistic health adviser? Maybe we should gather all the professionals from different specialties together to answer; what is health? But who are we leaving out? Suppose you organize a meeting with all the professionals to formulate a definition of health, or suppose you want to make a personal model that predicts your own health (that’s what I want to do). Who will you invite (what will you measure?)? We have the dietitian, the sleep-scientist, and the movement scientist. But some psychologists, biologists, doctors, physiotherapists, acupuncturists, and many more professionals will feel left out. They will insist on joining the club. We will simply never know when we have invited everyone with an important say in the matter. The same accounts for me, when I am measuring my own health, I can never know whether I measure everything that can increase my health. There can always be a variable that you are forgetting (or is a stable variable) that predicts more of your health than you are aware off. I don’t measure my oxygen-intake, because I have enough to life healthy, but once I lose my fresh air, it might hurt me more than I expected because they contribute massively to my health. As with many cases we don’t really know how to measure the most important concepts in our lives; how can we measure happiness, health, and well-being? If we are looking at a lower level; the same issues arise; how do we measure sleep, nutrition, and activity? 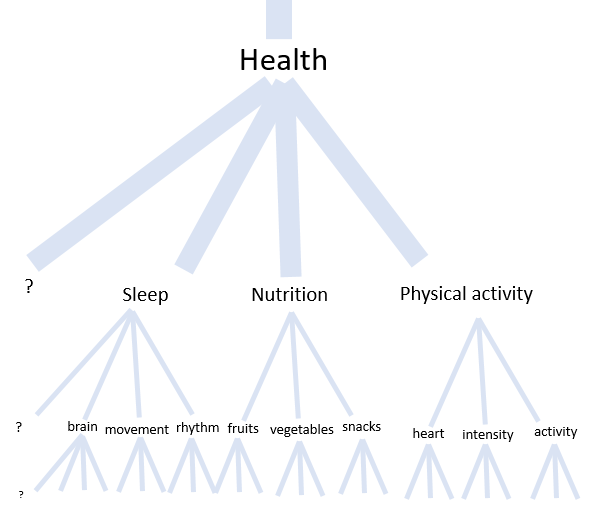 And how can these variables be combined to indicate larger concepts such as health? We can’t, because these concepts are not measurable (yet). This is a paradox, that I would like to name “the fractal-paradox of measuring” because it arises at every level of measuring, and is therefore a self-replicating problem. At every level of measuring we don’t know how to measure each concept exactly, and we aren’t sure whether we are aware of all the concepts that make up the larger concept. Furthermore, we don’t know how to combine each concept of every level to make up the larger concept. This problem occurs at every level. We don’t know the ultimate way to measure our brain activity (to say something about our sleep), we don’t know the ultimate way to measure sleep (to say something about our health), and we don’t know the ultimate way to measure our health that says something about our being. And again, this paradox is present in many other fields (of research). The fractal paradox of measuring visualized. The definitions at every level are just examples. Constructing measurable definitions of concepts is the first step to solve this paradox. If you would replace health by longevity for example you have a much easier story. If you do that, you have this level of the fractal solved. However, if you put too much value on one measure alone, you might lose track of the other variables in life which that are also important, like fun and other (risky) pleasures. Thus, one could ask himself if he wants to measure and define everything that he wants to achieve. Usually, this makes achieving goals easier, because they are less abstract. But on the other hand, not-measurable (or forgotten) variables might be neglected. To avoid this, you might not want to measure every goal and just work with vague concepts that most people understand. Looking at your current state, and your change over time might be less clear but you become better at looking at the full picture. I guess it’s up to you, and your situation to choose your preference, good luck!